Mandrake #239. Note: Incorrect date is printed on inside, December 11 1969. 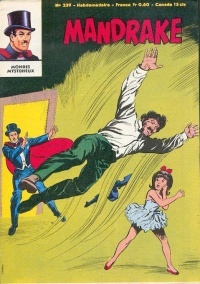 "Chasse aux gangsters" ("The Meeting of Mandrake and Lothar" part 1) by Lee Falk and Fred Fredericks. This page was last edited on 13 May 2017, at 18:14.